Lady Serena has over 40 years experience in styling for fashion parades, television celebrities, photographic shoots etc., and was certified in 1992 as a Colour & Image Consultant and quickly became the top Image Consultant for Australia during her first year. Having over 30 years experience teaching in her own Finishing School covering the subjects of deportment, etiquette, speech, fashion,wardrobe,makeup, skin, nails & hair care and previously in a top Sydney Finishing School gives her the ability to deliver programs that are second to none. As a highly experience Makeup Artist & Creative Hair Stylist as well, Serena works with photographers to create any look and feel for Advertorial, Editorial, Television Commercials, Events or Promotional Campaigns. This results in strong product images & client satisfaction. Serena's Image trains and represents a team of Creative Stylists plus Image and Colour Consultants. Colour & Style Services- an experience to last a lifetime! 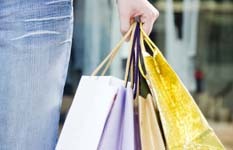 Book now for your personal shopping expedition, wardrobe audit, colour analysis with makeup lesson or personal styling. Gift vouchers available - give the gift of colour and / or style- the gift that lasts. Are you stuck in a colour rut? Typically after a colour analysis consultation you will gain the WOW factor! Your friends and colleagues will notice how great you look, that’s the power of colour. It affects our mood, our perceived body shape and age. Wearing your best colours can make you look younger and healthier. Wearing unflattering colours can age you and make you look ill.
using the flow seasonal method. We will analyse your skin, hair, eyes and facial features and discover the colours that suit you best. You will learn your best precious metals and your best hairstyles, eye wear, hats, earrings to suit your face shape. Included are: your flow seasonal colour fandeck plus a makeup lesson using your most flattering colours with professional Jane Iredale products. Gift vouchers are available to suit your budget for Jane Iredale Makeup products. Valentines Day 2019 special $250.00-Please note consultation must be paid for by February 14 although you may have three months to enjoy this experience. Learn how to dress for your body type, the art of illusion dressing and the best styles to suit you. Use line, design and colour to create your most flattering looks. Discover how to use focal points to draw attention to your best assets and how to disguise your challenge areas. Find out how to choose accessories and your best style elements. Stylish dressing is a combination of the science of body shape and art. We show you how to use line and design. Learn how to discover your personal signature style and ‘own’ it. Enjoy the full Image & Colour experiences at our special prices. Entrepreneurs, executives, business owners,corporations, university graduates private individuals, wanting to gain refinement and confidence to be powerful in all situations. This is the perfect compliment to technical and business expertise, where you will improve your total image. This will in turn build confidence, professionalism and enable you to better represent yourself and your business. Be empowered with all the skills for success! Our goal is to help people understand the importance of image for the corporate world and to assist people in developing skills that will not only impact their own lives but also the lives of others. What will the course participants learn? choose hairstyles, garments & accessories to flatter & enhance. market yourself-put your best foot forward! The one day Style Your Image course is a detailed introduction to styling and fashion coordination for your own image and becoming more fashion conscious or it could lead to the start of a career as a fashion stylist. A dedicated day for yourself - discovering what suits your body type, face shape, colouring, lifestyle, personal style expression and personal culture. Learn to develop your identity and how style can influence your career and personal life. The day will include a power-point presentation covering body shapes, how to coordinate colours, fabric textures and how they affect the silhouette, style illusion, focal points and accessorising. We will also cover face shapes, wardrobe planning, fashion budgets and how to make them work. Wardrobe capsules & how they work using key items as a basis to work from, creative ways to make unique statements, fashion icons and their secrets to styling, the classics every woman needs to own, how to gain confidence in your fashion and fabric choices. Focus on hairstyles and eyewear to suit your face shape, understanding dress codes for various occasions and styling to suit the look, identifying fabrics, understanding which fabrics are most suited to your figure type and developing your sense of style. We will go through a Trend Analysis and look at real street-fashion.